Ready to never miss the bus again? Track Me Mobile is a locally produced, consumer transit tracking system, designed to be easily accessed and viewed on smart phones, tablets, and desktop computers. Track Me Mobile utilizes a microcomputer, and the same type of processor as a cell phone. It runs off a 5V power supply, and a Wi-Fi hotspot or USB modem provides an internet connection. A connected GPS antenna fetches location data from satellites. Our proprietary software interprets location coordinates and submits them to a database which updates the vehicle position on a route map display every 2.5 seconds. Each Track Me Mobile client is provided with a unique web-app address for easy consumer access of one or multiple routes. Web-apps can be made "open to the public" or restricted for login and password entry. A dispatcher UI is provided for clients that have several routes and vehicles. 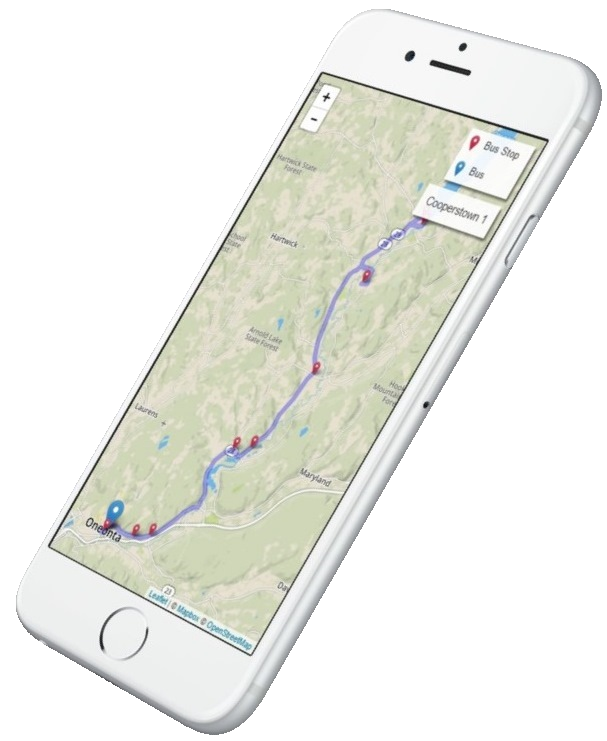 Our basic technology and display is designed to be simple and trouble-free - as a "real time" GPS tracking service. Other, more robust options are available, including several accountability features such as history, mileage, etc. A "route" is any number of buses which follow the same planned route, whether they run at the same time or different times, and whether they run the route on a similar schedule or an alternating schedule. A fleet of buses serving a college campus, for instance, may have several routes, but there may be more than one bus on a given route at the same time. If the schedules are different, but the route is the same, you'll see all buses running on that route. Public routes that are currently contracted are listed to the left. Click on any route to visit that route's page and see where that bus is right now! Please note that not all routes run at the same time, and our system only tracks units currently online. Interested in joining the family? Click "Join" at the top of the page to request a quote! If you're interested in joining the Track Me Mobile family, you can use the form to your left to request a quote. We'll need some basic information in order to set you up with a quote, and please note that your quote is not final. All quotes are subject to adjustment, and are only meant to give you a ballpark figure based on basic information.